Erasmus Darwin (1731–1802) was the grandfather of British naturalist Charles Robert Darwin (1809–1882). Erasmus was a physician, inventor, and natural scientist who published a book on his ideas (Zoonomia) between 1794 and 1796. The book contained poetic couplets describing Erasmus Darwin’s ideas about science and, in particular, the evolution of life. Erasmus Darwin’s hypothesis was that all the animals on the planet had their origin in a “vital spark” that set in motion life as we know it. In his posthumously published book Temple of Nature (1803), Erasmus Darwin further speculated on a theory of evolution that included basic ideas on the unity of organic life and the importance of both sexual selection and the struggle for existence in the evolutionary process. 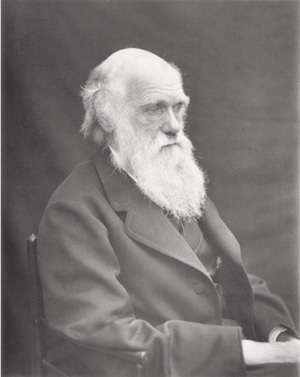 Years later, in writing a biography about his grandfather, Charles Darwin acknowledged that his grandfather’s ideas had influenced his thinking. A 1874 photo of Charles Darwin, long after he had become famous for his theory of natural selection.